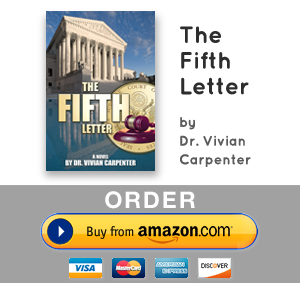 “The Fifth Letter” is a serious work of fiction built on a platform of research about the U.S. Supreme Court, American History and Dr. Carpenter’s search for her family history. It is rooted in the experience of African Americans from Jim Crow to the present day. “The Fifth Letter” is also a story about love and the price that Justice Katherine Helena Ross, the first African American female on the U.S. Supreme Court, must pay to live up to her father’s dreams for her life. Love is what we all want and need in this life. Love is a greater power than fear. I believe when we overcome our fears, we’ll find love. Enjoy.